Crutches are an invaluable tool in aiding disabled individuals to retain a certain level of mobility while injured. Many different types of crutches have been designed in order to meet the needs of the population and much research has been devoted to find which crutches are best in assisting injured individuals with mobility. The swing-through gait motion that occurs while a person is on crutches, has been studied by many researchers. Thys et al. (1994) conducted a study in order to analyze the energy cost, mechanical work, and muscular efficiency for the swing-through gait in elbow crutches. Andrews et al. 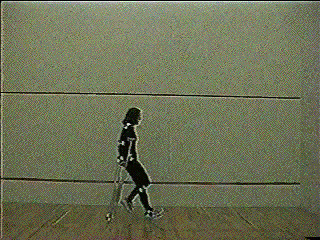 (1994) did a similar study using harness crutches. The goal of our project was to compare the swing-through gait with shoulder wrapping "hope" crutches to standard "saddle" crutches; limiting it to a biomechanical analysis. One of the main differences between the two crutch types is that the Hope crutches have a vertical extension of approximately six inches that once under the armpit extends to the distal end of the clavicle. The Standard crutches, on the other hand, do not extend past the armpit. The other main physical difference in that with the Hope crutches there are handles to hold onto that extend anteriorly to the crutch leg. The handles on the Standard crutches are directly in line with the leg of the crutch. We anticipate that our study will provide us with evidence that will allow us to recommend one set of crutches over the other to injured individuals by showing that one is superior in terms of biomechanical stability within this swing-through gait. We predict that the Hope crutches will prove to be the better crutches, but we also want to see the level of greater stability it provides compared to the Standard crutches. We will quantify stability according to the range of motion that it offers at the knee and the hip joints. In the case of crutch gait, a smaller range of motion will be associated with greater stability because it illustrates the constraints placed on the movement. This will allow an injured individual to better weigh the costs and benefits of choosing a set of Hope crutches over a set of Standard crutches. Joint angles and velocities will be used as the determining factors as we attempt to deduce a conclusion to this study. Our approach in attacking this study is to videotape the motion using one subject, then analyze and quantify the movement using digital imaging techniques. 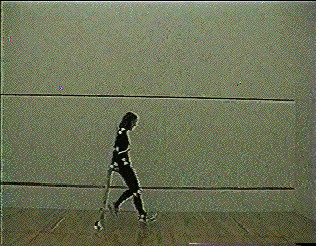 Then we will be able to compare and contrast the movement with the different types of crutches.